"There are so many people running for the door not just because the ship is sinking, but because the captain of the ship is screaming at them, blaming it on them, and telling them it's their fault." You might be excused for thinking these quotations stem from some terrifying, corporate Ayn Rand winner-takes-all hell-hole where fear, intimidation, and bullying ruled the day. Ironically, these quotations come from employees of two of the most famous retailers on the planet. While the other, by all accounts, is about to become a sad footnote in the retail history books. Of course, I’m talking about Amazon and Sears, and there's no prize for guessing which stock ticker belongs to whom. Case in point, Amazon CEO Jeff Bezos is purported to have made over a billion dollars in one day from all the Alexa hoopla at CES in January of this year. Not too shabby for a place where employees practically combust. To further highlight the dichotomy, many consider Amazon to be on an enviable track to become a trillion dollar company and it’s certainly rolling out a rapid-fire slew of innovations (Dash, Alexa) and PR-worthy concepts (GO, Blue Origin). Also, in the type of folklore usually reserved for Silicon Valley start-ups not billion dollar companies, it hasn’t shied away from “failing fast” (Fire) either. Conversely, at Sears, sales are down 37% since early 2013, its debt load has spiked to over $1.6 billion, and the company is losing well over $1 billion annually. So, on the surface, you could read these employee comments and conclude that both organizations have toxic cultures. But if the cultures are equally “toxic,” how is one organization a leader while the other is undoubtedly a laggard? Well, we could start by taking a hard look at how each organization defines their organizational Purpose. Amazon’s focus on Pioneers is a highly motivating call-to-arms, which is likely backed up throughout the organization’s deployment of resources, technology, and systems. And, most importantly, is equally motivating to Amazon employees. In contrast, Sears description reads like a lackluster focus on operating efficiency, returns on shareholder value and other financial measurements. Speaking purely for myself, the “Wow!” experience articulated is one I’ve seldom seen from my interactions with any part of the brand. And the irony of “Be the world’s best retailer” signals an organization grossly out of touch with today’s market. Perhaps the other issue is that we’re using the culture term haphazardly. And, perhaps, we’re not acknowledging some key nuances and learning between Amazon and Sears. For example, when we discuss Culture, we often point to phenomenon like remote working, open plan offices, bring your pet to work environments, sushi Fridays and a proliferation of foosball tables as reflective of an open and progressive culture, add in employee engagement surveys and you’re really rocking. But Culture is more nuanced and complex than this. 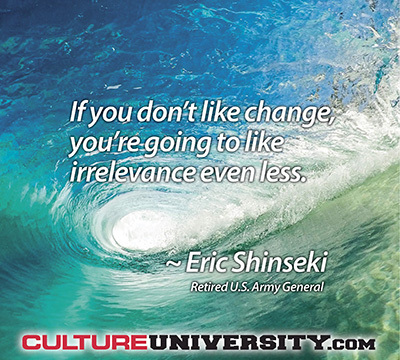 The good folks over at Culture University talk about the differences between “climate” and “culture” and, you guessed it, all those attributes above aren’t culture cues, they’re measures of organizational climate. Just because management insists that trust develops at the annual picnic, it doesn’t mean you're working in a trusting culture. Cultures where the founder still walks the halls (Amazon) operate with an entirely different dynamic than one’s where the founders passed away decades earlier. When the guy whose name is figuratively on the door still presides over who gets blessed and who gets banished, there is little incentive to change the way things are gonna get done. Less than zero if the organization has a history of success. Look at how people describe the vaunted culture of innovation at Apple under founder Steve Jobs versus under CEO Tim Cook—and that’s only in the space of five years! Then there’s the issue—as I did myself at the start of this post—of evaluating and labeling a culture “good,” “bad,” “progressive,” or “toxic” without evaluating it against the fundamental business criteria that matter … Is the Culture accelerating or impeding the execution of the organization’s strategy? If you're interested in reading deeper into the articles that spurred this post, the Amazon examples sprang from a New York Times expose in August 2015, and the Sears examples come from a story covered by Business Insider in January 2017. Does our organization have a Purpose that inspires and motivates our employees? Is that Purpose used as a consistent guide for our internal communications and also how we structure our teams and operations? Can we articulate our Purpose in a set of abiding Values that we hold Leadership (and all employees) to? I welcome your comments and ideas on social media.